It’s all quiet over in the Fediw house right now. My husband is back from training in New Orleans and it’s so nice. Although, he is still gone quite a bit right now due to flooding in a nearby town (he’s in the Coast Guard and he gets to help with stuff like that), it’s still good to see him at night. After the girls were to bed we spent some chill time together eating m&m’s and catching up. I love the times we get to share together. But now he’s asleep so I needed to come over here and say hi and continue sharing gifts I made for Christmas. We are blessed with a lot of extended family and this year it’s growing even more. My sister in law is having a little girl and she’s due any day now. It’s so exciting! Yay for girls! Well, you know I just had to make the princess something. 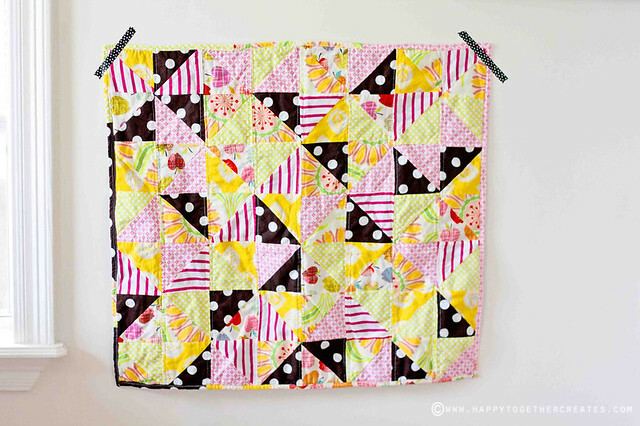 I made this tringle quilt using this type of half square triangles. I just grabbed fabric from my stash and made it as big as I could. I didn’t want to make a big blanket, just a smaller one this time. 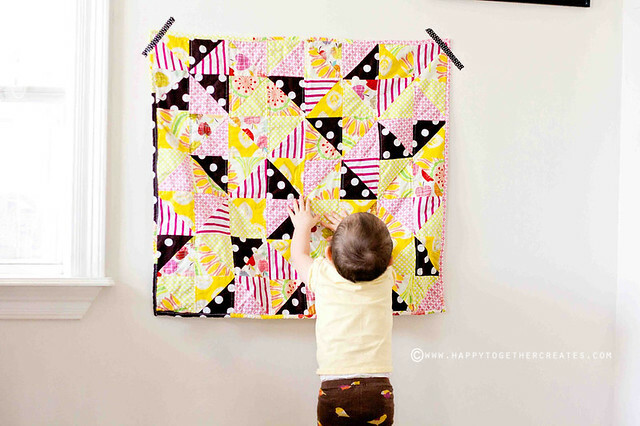 I have gotten so much use out of miss E’s little quilt and love that size for when they are little. 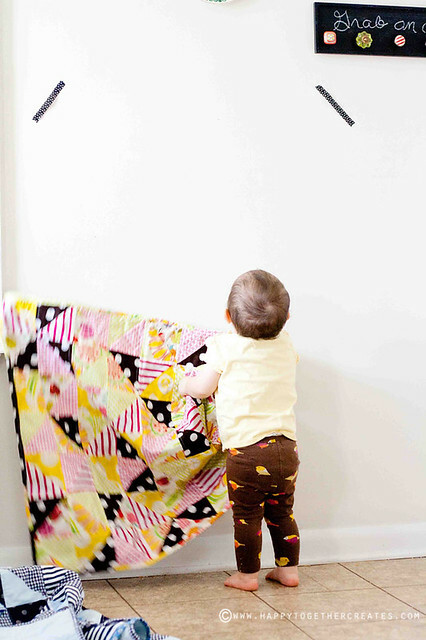 Speaking of miss E, she caught me taking pictures and was so ecstatic about a quilt hanging on the wall! 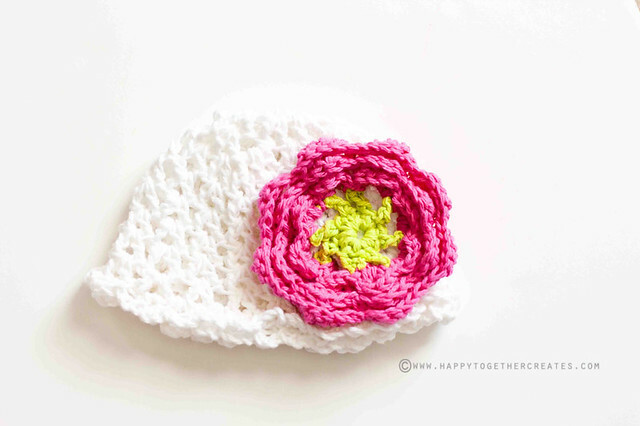 I also made this little hat using this pattern. I liked it. It was an easy project with great results. Lastly, I made my niece this zebra hat. Yes it’s a zebra. I know. It kind of looks like a pig, but I promise it looks more like a zebra when it’s on a babies head than like this. Just check out the the one the creator of this pattern made here. I tried it on miss E to make sure it did 😉 Now we anxiously wait this little ones arrival. We are so excited! Have I said that enough? I won’t get to see her in person for a while which makes me sad. But thankful for email so I can see pictures! I won’t lie, I thought it was a pig too. But either way – it is as cute as a button!! 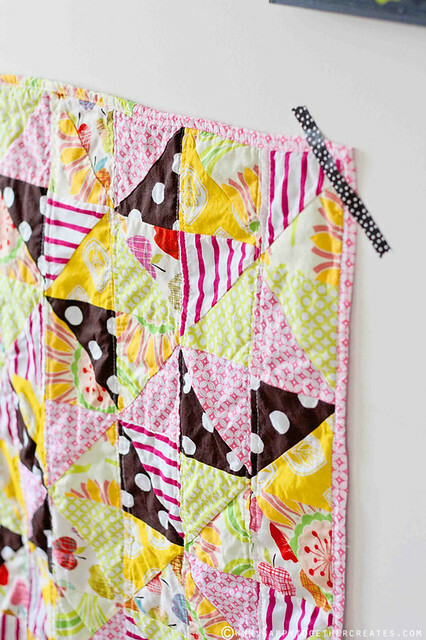 Such a sweet quilt Jessica! 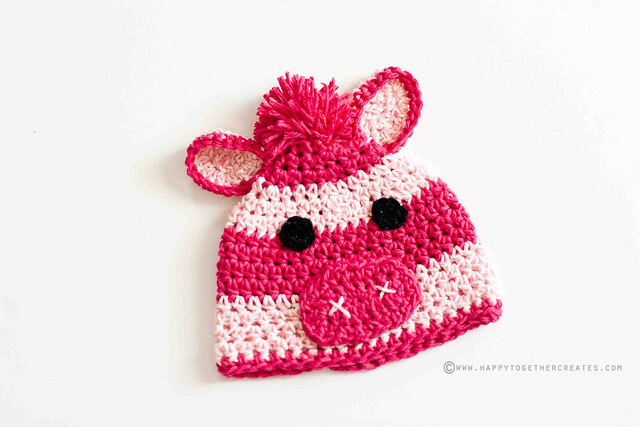 And pig or zebra, the hat is adorable either way :).